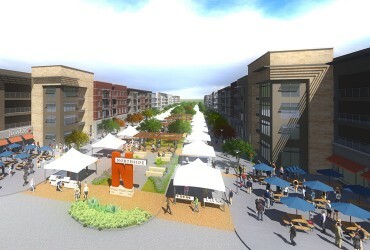 Developers are about to break ground for a major mixed-use development at the University of Texas at Dallas. The $54 million Northside project will include housing for 600 students plus retail space in a 4-story complex of buildings at the north end of the university campus. Balfour Beatty Campus Solutions LLC and Wynne/Jackson Inc. are building the project on 13 acres near the intersection of Synergy Park Boulevard and Floyd Road, adjacent to a future commuter rail station site. Current housing at UTD is full and the demand is strong for more units, said Wynne/Jackson principal Michael Jackson. Construction will start in April and Northside is set to open in August of next year. “Northside at UT Dallas is essential to support the tremendous growth our campus has experienced,” Dr. Calvin D. Jamison, vice president for administration at UT Dallas, said in a statement. “Over the past seven years, our enrollment has increased from 14,500 to almost 23,000 students. Jacobs Engineering and Architecture Demarest designed Northside. Balfour Beatty Campus Solutions provides development, asset and property management and other real estate services to colleges and universities, Wynne/Jackson is a 35-year-old Dallas-based real estate development firm.